more flexibility, improving its trademark snappy Ballet Line transition to toe off. At a very light 7.6 oz/ 215 g US size 9 the D4 slots into the less an 8 oz heavier duty race flat light trainer category with shoes such as Adios Boost, Hoka Clayton or Tracer, New Balance 1400, Saucony Kinvara, or Nike Lunar Tempo. With a 22mm heel 17 mm forefoot stack and 5mm drop, there is plenty of decent forefoot cushion, 4mm more than what I see as the closest comparison the Adios Boost. It is also not a slipper like unstructured shoe such as the similar weight Nike Lunar Tempo. The upper, while not a race flat fit, still has plenty of support and decent volume. And if used as a trainer, unlike more race oriented shoes, there is plenty of durable rubber outsole coverage although we have some concerns about wear The ride is equally comfortable at slow or fast paces. My miles to date in the D4 have been fantastic at all paces from slow and easy to faster tempo and half marathon racing. It is rare that a light shoe can pull off such versatility. Don't be mistaken this is not a soft ride, it's quite firm, snappy with a bit of pop off the road and responsive but at the same time it is not a punishing ride. The D4 fit me true to size. I did move to the rear lace to better lock the heel. The heel collar opening is fairly wide, wider than I like to see in a light performance trainer racer. The fit is somewhat more relaxed than a typical race flat with fairly even, comfortable support throughout. The upper is a conventional soft thin mesh with Salming's Exo Skeleton support as a single overlay on each side. There is a conventional lightly padded tongue with a partial bootie inner sleeve starting near the 2nd red lace hole. The upper, while retaining the effective Exo-Skeleton approach, is completely different than prior models of the Distance. The Exo Skeleton is bonded to the outside of the mesh upper. In prior versions the support overlays were bonded to the inner mesh next to the foot with a very fine but open fish net like outer mesh only attached at the laces and midsole, so free floating. Clearly the new approach saves a lot of weight. Gone is the "tubular" feel of the prior uppers, unique, but I prefer the new approach The toe bumper is much softer material than the D1 and less extended than either D1 or D3. 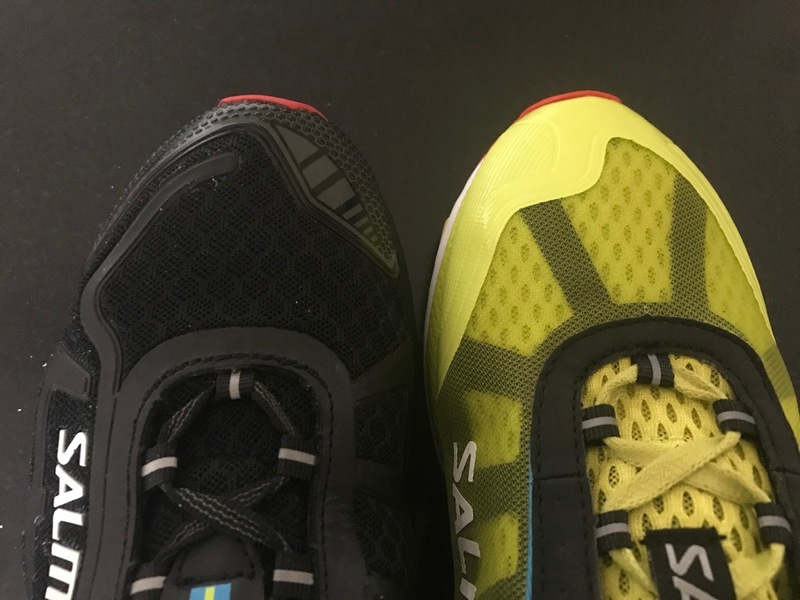 The softer and less extensive toe bumper, lighter upper, fewer Exo Skeleton overlays at the front of the shoe all contribute to much better flexibility and front of the shoe comfort and perception of volume. Gone is the noticeable sense that the toe top of the bumper was pressing on the toes of the D1, improved but still there with softer toe bumper in D3. It seems to have a similar last as its predecessors with it appears more width at the metatarsals as the D3 has. It it is literally, by the new construction, more "pulled together "over the foot for a more secure overall foot. This is not a wide or very high volume shoe but I have no pressure points at mid foot or forefoot. It is also by no means a relaxed sloppy fit or a super snug one either, so a well executed happy medium suitable for training and racing and many kinds of feet. The midsole is made of a single layer of Salming's proprietary injection molded RunLite EVA but made a bit softer than prior versons. I welcome this change. The D3 was a bit on the firm side for my daily training. Shoe geeks will know that some midsoles are injected molded and others produced by compression molding. Examples of injection molded midsoles include Skechers 5Gen. Nike Lunar shoes, Hoka RMAT and Speedgoat, and others. I find that injection molded midsoles seem to bottom out to a feeling road shock less than compression molded ones. 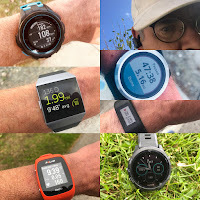 While they do not have the distinct bounce of adidas Boost or now Saucony Everun molded from TPU they do have some sense of rebound or pop, a more subtle one while at same time retaining responsive snap and stability. The D4 follows this pattern. "The distance from heel to the ball of foot (62% of the shoe) has been designed with extra stability, which ends in the so-called “ballet” line, a 75° angle. In front of the 75° line, we have equipped the shoe with greater flexibility to stimulate the foot’s natural movements. The TGS 62/75° feature assures that the shoe bends in exactly the right places, stimulating the foot’s natural lateral and forward movements." The Torsion Efficiency Unit of hard plastic under the midfoot between midsole and outsole is similar to adidas Torsion. This element really stabilizes the foot. It is not a pronation control mechanism such as firmer foam further back. The Ballet Line is where the Torsion Efficiency Unit ends. As it is slightly longer on the medial side (bottom of picture below) it creates the flex point at a 75 degree angle just in front of the first black triangle of outsole foam in the center or the shoe . There is a distinct sense of rolling off to toe off from this feature, yet with, as they say with lateral and forward stability. As the D4 is now more flexible the feature is more effective and noticeable, particularly at slower speeds. It is a very pleasant and effective sense of forward efficient momentum that feels natural. The outsole itself has 2 grades of rubber, a durable rubber at the heel and light weight rubber further forward. The outsole rubber appears to be softer than on the D1 which was among the firmest I have run recently. Heel wear to date has been somewhat uneven between shoes as my left shoe is showing accelerated heel wear on the lateral side just ahead of the rear of the heel while the right heel has no wear. I have about 30 miles on the Distance 4. The forefoot red rubber is showing practically no wear at all on either shoe. As I know I scuff my left heel more than my right due to a recent injury this tells me that abrasion resistance from scuffing may be an issue for some. There are always trade offs for such light weights. I will apply some Shoe Goo! 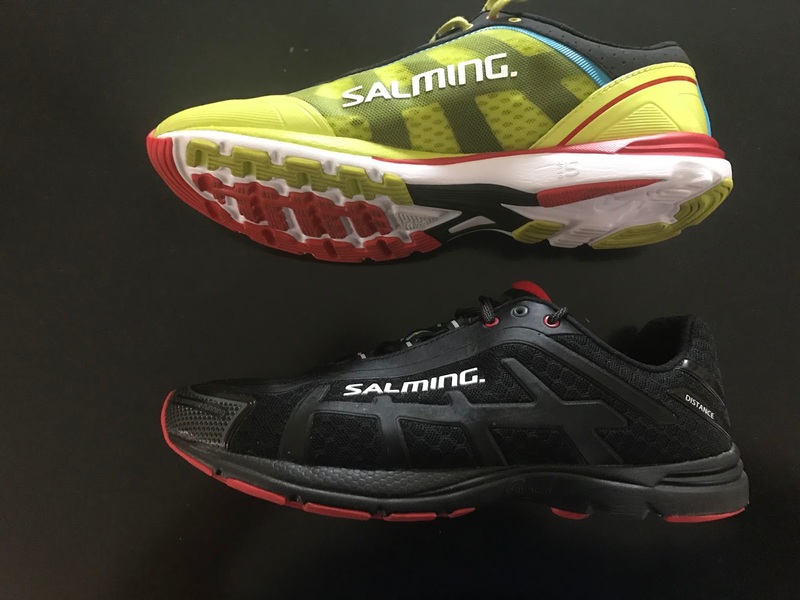 The Salming Distance D4 has a firm yet in no way harsh ride. There is a touch of pop when compared to the D1 from the injection molded RunLite midsole and softer outsole, more felt in the forefoot than the heel. Overall responsiveness is excellent without being painful and jarring. The transition to toe off is very smooth and well stabilized by the Torsion Guide System. Similar to the Hoka Clayton, but unlike for example the Adios Boost or a New Balance 1400 or Zante I have no problem daily training or racing in the D4. In fact the ride at slower speeds is exceptionally good, softish for a performance type shoe while the ride at speed seems to firm up as it should. A more conventional lighter upper and softer cushioning make the D4 a significant upgrade to the D3. If you like your shoes light, decently cushioned, with some pop and want to simplify to a single shoe for race and most training miles the D4 is an excellent choice. Almost the same in weight the ride and fit are very different. The Lunar Tempo's super relaxed upper and 4mm of softer additional heel stack is better suited to long runs and marathons for me, the D4 for shorter races and tempo. I would give the nod to the Lunar Tempo for overall comfort and the D4 for performance. The Clayton is slightly lighter and definitely more cushioned without being soft despite being of a higher stack all around. Overall the Clayton is a more versatile shoe but its transitions are more awkward due to its stiffness. I would pick the D4, and did this past weekend, for a half marathon and the Clayton for hillier longer races and training. The Tracer is far firmer and for me is a pure race shoe and even for a 10K is at the edge of to firm for me. Hands down the D4 for me. The 1400 Reslyte midsole is overly firm and harsh with lots of road shock the D4 just doesn't have. Another close comparison. The Kinvara 7's upper is very snug over the instep and has a more dialed in race ready upper. The D4 overall is just more comfortable and versatile. The D4 is far more responsive and flexible at the front of the shoe, more fun. We have included a comparative table of running shoes in the D4's 7-8 oz range. The RTR Ratio listed: add forefoot and heel stack divide by weight for a measure of the cushion per ounce of shoe. Higher is better. Of course other factors apply. 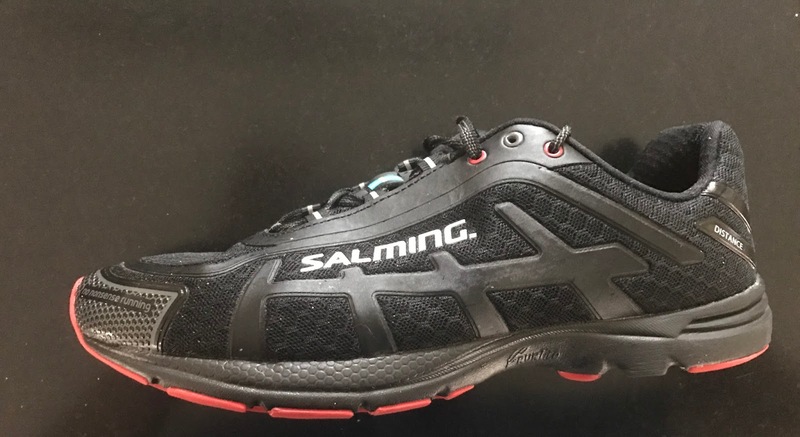 The Salming Distance D4 was provided at no charge to Road Trail Run. The opinions herein are entirely the author's. 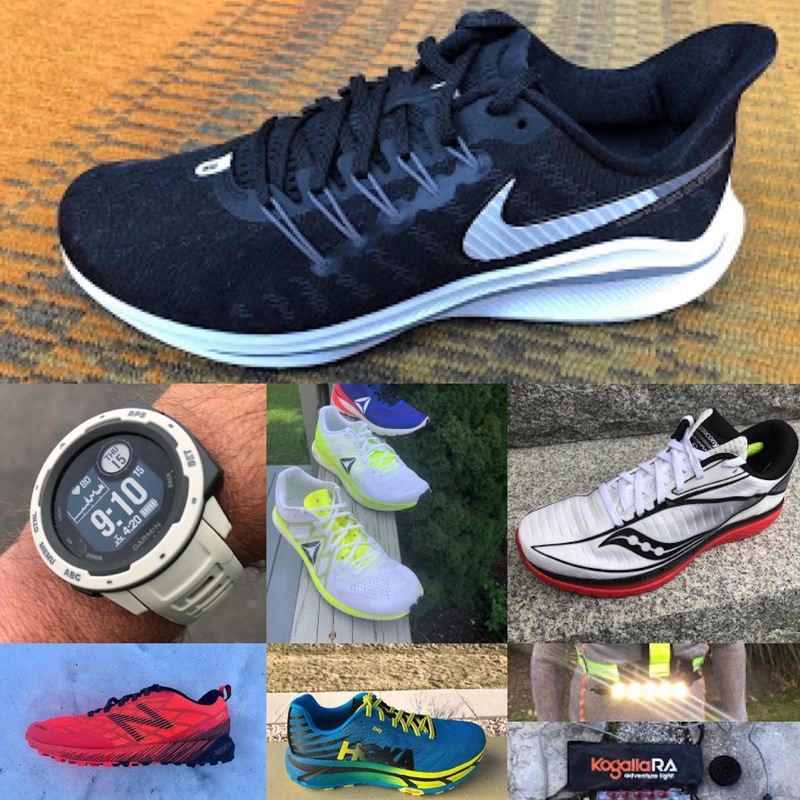 Over 45 in depth Road and Trail Shoes reviews so far in 2016! Great review! Sounds like quite the shoe, super light. Looking forward to updates on their trail line, hopefully they can get them similarly dialed in as they did here. 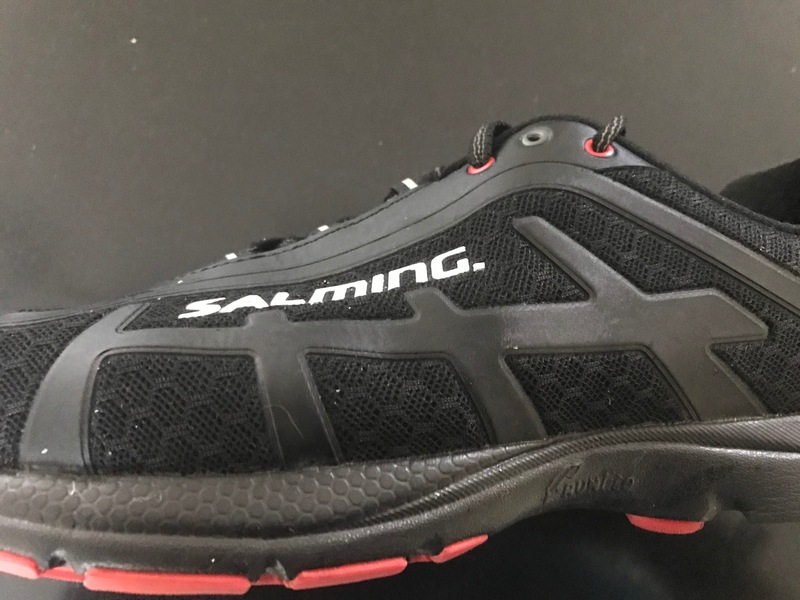 I haven't tried the D4 but I can comment on the durability having run in three different versions of the Salming Distance D1 which is my most common daily trainer. I have three different versions of these and I find the durability actually being excellent. The first pair is approaching 1000 miles by now and is still definitely runnable although they are beginning to be somewhat stiff in their cushioning by now. Yes the outsole shows some wear early on but it does not seem to progress very much from that. The upper of the shoe is as if they were brand new, no wear at all despite running outside all year-round in cold Swedish winter conditions. I appreciate the Salming Distance very much for its versatility just as it is stated in the review. Excellt shoe!